Linear actuators have several exciting benefits to offer when it comes to the automation of your recreational vehicle. You can exploit the benefits of actuators in several ways to automate the vehicles’ functionality the way you want, and enjoy the safety and comfort of a home while being on the road. 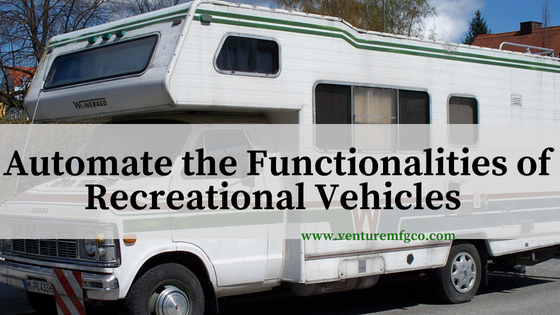 This post discusses a few of the many applications of actuators in recreational vehicles and how they help ensure a stress-free trip. Amongst the several actuators models available, the one that is commonly used for the automation purposes is RV slide out actuators. These actuators, which comprise ball screw designs along with DC motor gearboxes, are designed for high static and dynamic load ratings for tension and compression. Let us now see a few examples wherein RV slide out actuators provide convenience to users. Retractable Awning: Recreational vehicles with retractable awning have several benefits to offer to the travelers. It not only shelters you from blazing sun or the pouring rain but also helps reduce the temperature inside the vehicle tremendously. Thanks to the efficiency of linear actuators that make the working of retractable awning possible with a press of a button. Retractable Power Outlet: Yet another necessity people prefer inside an RV is power outlets to charge their electronic items. RV slide out actuators greatly support the working of retractable power outlets, thus offering great convenience to travelers. Structure Expansion: It is always comfortable and convenient when you have some additional space when the RV comes to a stop. How is this possible? Linear actuators play a major role in creating expandable rooms, floor panels, and much more. When not in use, the structure can be made to the original form with a press of a button. They help automate the functioning of reclining chairs, automated television displays, and beds and tables (raising or lowering) in the vehicle. RV slide out actuator goes into the making of automated wheelchair lifts and wheelchairs for the physically disabled travelers. These actuators can be easily raised into the vehicle. They streamline the working of storage compartments located in the floor of the vehicles and also satellite dishes on the roof of RVs. They support the automatic functioning of toy hauls, televising frames for easy viewing from all angles, retractable rear panels among several others. Thus, by offering benefits in terms of precise smooth movements, and adequate positioning for a variety of applications, RV slide out actuators play a major role in providing people a hassle-free experience when traveling in RVs. There are several actuator manufacturers who support the recreational vehicle manufacturers by providing customized dc actuator motor for trailer, landing gear accessories, and DC actuators. Venture Mfg Co. is a trusted and leading 9001:2015 certified manufacturer of actuators for recreational vehicles. In addition to this, the company provides dc actuator motor for trailer, landing gear accessories, etc.